Imagine a beautiful summer's day by the lake - birds singing sweetly, flowers swaying gently in the breeze, and the familiar buzz of dragonflies as they skip across the surface of the water. These little creatures have captured our imagination for centuries and have been the inspiration for many pieces of artwork. Dragonflies belong to the Odonata family, along with Damselflies. Legend has it that they descended from dragons, as such, they were named in honor of their mythical ancestors. Dragonflies have been a large part of many Asian cultures. The beautiful islands of Japan were once known as Akitsushima or the Dragonfly Islands in honor of the noble insect that helped Japan's mythical founder, Emperor Jinmu. Since then, dragonflies have had a special place in the Japanese culture. They are the focal characters of many cultural pieces of art and literature and are symbols of Courage, Strength, Prosperity, and Happiness. In parts of China, dragonflies are emblems of Purity, Harmony, and the subconscious mind. As a creature of the natural element, Water, dragonflies are emblems of emotions and their presence represents the purity of our deepest thoughts and dreams. They are tools of meditation and many yogis and spiritualists believe that the dragonfly shows humans how to live in the moment. Dragonflies have also inspired various works of art. Native American tribes like the Zuni and the Navajo see dragonflies as symbols of Speed and Agility, and often depict their image on tribal pottery, rock art, and necklaces. During the Art Noveau Revolution in the early 1900s, dragonflies and beetles were the main feature of haute accessories. However, Dragonflies didn't always have such a positive reputation. In parts of Europe, they were seen as the Devil's Advocates, sent to create chaos. In Portugal, they are known as 'eye catchers' and in Sweden, they are said to buzz around and judge the worthiness of the souls of naughty children and evil adults. The Dragonfly would then stitch up their mouths, ears, and eyes to prevent them from doing more misdeeds. Whether you're seeking inner harmony or confessing your misdeeds before the Dragonfly comes to get you, Dragonfly Tattoos always make great works of body art. Fulfill your innermost wishes and dreams with a Dragonfly Fairy Tattoo. Magical fairies dwell in the realm of our imagination, playing tricks and granting wishes to humans who are worthy off their favors. Much like the Dragonfly, they spend their days fluttering about with nary a care in the world, which explains why both creatures are considered to be emblems of Frivolity and Freedom. Dragonflies live near bodies of water, the natural element associated with the Subconscious and human emotions. They embody Prosperity and Luck. Dragonfly Fairy Tattoos represent your connection to Nature, Innocence, and show off your fun side, and are particularly popular with women. Flowers are Nature's symbols of Femininity, Youth, and Beauty, whereas Dragonflies are emblems of Freedom, Frivolity, and the Subconscious. The type of flower in the artwork is of great significance and changes the overall meaning of the design. 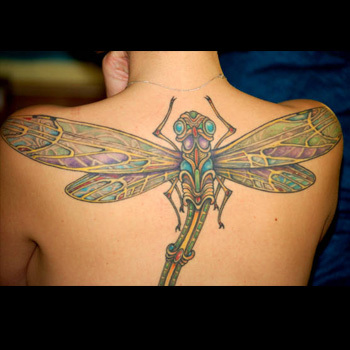 Dragonfly and Flower Tattoos embody Feminine Beauty and Freedom. Dragonflies and Butterflies are creatures of Transformation. Both go through a period of metamorphosis, changing from a seemingly ghastly pupa to a breathtakingly beautiful being. Both spend their days roaming the skies and are a sign of Freedom and Frivolity. On the other hand, a Dragonfly is also an element of Water, as such, it represents our latent emotions hidden beneath the surface. This design is popular with women. The beautiful black stripes of a tribal tattoo carry cultural and spiritual meaning for the indigenous people living in the region where the pattern originates. The exact meaning of each tribal pattern is a closely guarded secret of the tribe's elders, but in general, tribal patterns help to identify your spiritual and mental connection with a particular culture. Depicting a dragonfly using tribal images is also a way of infusing the unique spiritual elements of the little insect into the region's cultural identity. Tribal Dragonfly Tattoos signify the deeper mental and emotional connection with a culture and its people, as well as your quiet inner power. The right design is the cornerstone of every great tattoo. When coming up with a good design, it's best to think about what your new ink will symbolize, where it'll be placed on your body, and whether or not you'll use other elements in your design. The best artwork is one that you'll be proud to wear twenty years from now, so take the time to get your design perfect. For inspiration, visit our design page at www.itattoodesigns.com and take advantage of our Custom Design Service. Our team can design a one-of-a-kind piece that you'll truly love.